The National Hurricane Center is forecasting Tropical Storm Isaac to reach hurricane strength and hit around New Orleans late Tuesday or early Wednesday. 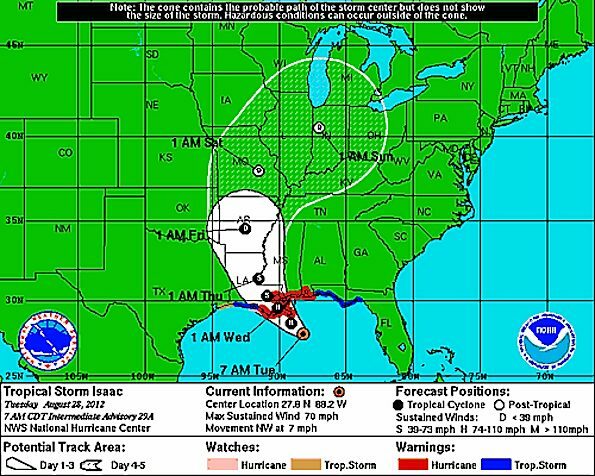 Tuesday morning, Tropical Storm Isaac slowed down to a northwesterly speed of 7 mph. While the storm is expected to be a hurricane soon, the biggest danger is expected to be caused by heavy rain. Up to 18-21 inches of rain are expected from about New Orleans to an area between Biloxi and Gulfport, Mississipi, and north just east of Bogalusa. 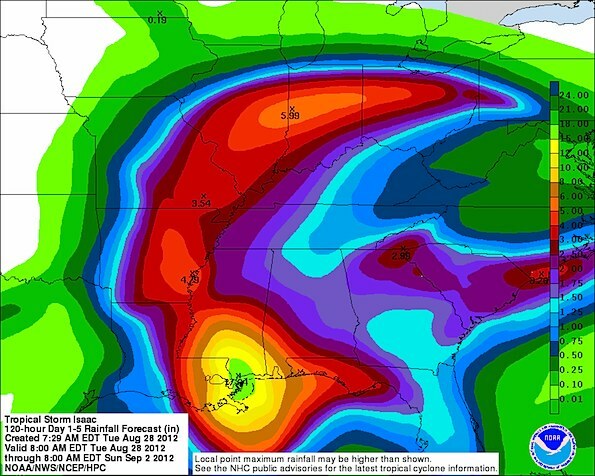 120-hour rainfall forecast valid 8:00 a.m. EDT Tuesday, August 28, 2012. Potential Storm Track of TS Isaac and forecasted Hurricane Isaac showing Isaac a hurricane in Louisiana and Mississippi on Tuesday and Wednesday, a tropical storm in Louisiana and Mississippi on Thursday, a tropical depression in Arkansas on Friday, and a post-tropical depression in Missouri, eastern Iowa, Illinois, southern Wisconsin, western Kentucky, western Tennessee, southern Michigan, and western Ohio from Saturday through Sunday. Post-tropical storm remnants are expected to be showers and scattered shower Friday night through Sunday night in Chicagoland. Friday Night A slight chance of showers. Partly cloudy, with a low around 70. Saturday A chance of showers. Partly sunny, with a high near 83. Saturday Night A chance of showers. Mostly cloudy, with a low around 69. Sunday A chance of showers. Partly sunny, with a high near 83. Sunday Night A slight chance of showers. Partly cloudy, with a low around 64. Labor Day Mostly sunny, with a high near 83.